We’ve all seen those pups with tear stains trickling down their cheeks. Even though it’s no indication of their inner-most feelings, you can’t help but want to give them extra love and hug those blues away. Luckily, tear stains are not a reflection of depression, but rather an indication of their tear production working in over-drive. With the correct stain removal products, you can get rid of them in no time and turn that frown, upside down. Tear stains are usually caused by excessive tear production (known as epiphora if you want to get scientific!) While this isn’t not usually call for alarm, it can sometimes be caused by more serious medical issues and if the problem persists, it is always best to consult your vet and get a medical opinion. 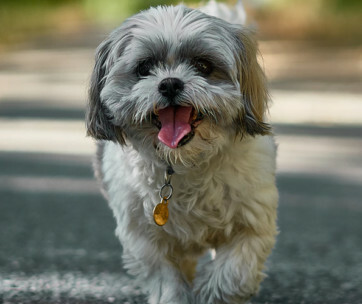 Tear stains are more prevalent in certain breeds like Maltese’s, Shih Tzus, spaniels, and Lhasa Apsos, and is more obvious in dogs with lighter coats which can stain more easily. Tears are usually reddish, or brown in color. Reddish tear stains are a result of porphyrins which are natural molecules containing iron and simply a waste product when red blood cells break down. They are usually removed through excretion; however, they can also be removed through saliva, tears, or urine. If tear stains are brown this is often a result of a yeast infection and more rigorous medical attention might be needed to clear the infection and get your pup on the mend. Whatever is causing the problem, paying attention to their medical needs, and keeping the affected area clean and well-groomed can go a long way in helping the problem. If you’re dealing with reddish tears and want to remove the stains from your doggie’s otherwise pristine coat, we have some fantastic picks from a number of reputable brands. These top dog tear stain removers will leave your fury-friend looking fabulous in no time and transform those sad looking eyes into sparkling ones in no time. Like all our lists we’ve combined a range of products to suit all budgets and needs. Whether you are dealing with puppy tear stains, or an older pooch, we have the pick for you. The first pick on our top list of dog tear stain removers is a delightful product by Tropiclean. This facial cleanser is infused with oatmeal and blueberry and will gently and effectively remove even the toughest of tear stains. This gorgeous and refreshing blend with soothe irritated eyes and works gently to avoid further irritation or harm. This product is also soap free and utilizes a gentle coconut cleanser to ensure ultimate comfort. 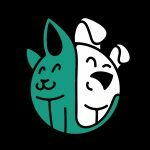 By avoiding harsh bleaches and detergents this brand will support your pup in feeling the best that they can and will turn those sad tear stained eyes, into sparkling ones that are filled with happiness. Number 2 on our list is a fantastic pick by Petpost. These amazing pre-soaked cotton ways are a fantastic natural eye cleaner and will help your pet go from sad eyes, to angel eyes in no time. This brand is chemical and bleach free and thus won’t cause your dog any irritation, or harm. Infused with juniper berries and coconut, this formula is a favorite amongst pets and owners alike and will leave your pup looking and smelling super fresh. With consistent and regular use these pads will remove Insightly tear stains from your dog’s fur and prevent a future build up. The pre-soaked cotton pads take away the bother of having to administer the solution yourself and are particularly handy for situations where you will be travelling. This company also care about the environment and their packaging and ingredients are recyclable. These are a great pick for busy dog owners who need to get the job done quickly and efficiently. Users have commended this product on being super easy to use and for the brands amazing customer service. 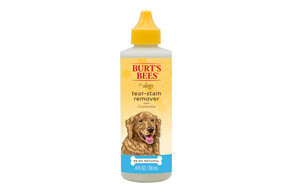 The third pick on our fab list of doggy tear stain removers is a super gentle pick by Burt’s Bees. The product is specifically made for dogs and embodies a rich infusion of chamomile for added comfort and gentleness. This pick removes tear stains safely and will clean away particles that cause irritation around your pup’s eyes. It should be used once daily for about 2 weeks to see great results and it suitable for old pups and puppies alike. Thanks to its balanced PH formula it is super gentle on the eye area and won’t cause harm. It is also free from harsh chemicals, colorants, and fragrance and thus puts your pup’s safety at the fore. Burt’s Bees is a company that pride themselves on avoiding parabens, petroleum, and synthetic fragrances, and thus only utilize the best quality for your fury-friends. Users have commended this brand for its amazing value, and effectiveness for tackling those problematic tear stains. Next up on our list of doggy tear stain removers is a fantastic pick by Angel’s Eyes. These angelic gentle tear wipes are the perfect aid to removing tear stains and built up debris that lead to crusty eyes and are super easy to use. By using these daily you will be able to keep the eye exterior clean and avoid a build up of tear stains. These are perfect for pet owners on-the-go, or for holiday trips where you don’t want to be fussing about administering a solution onto cotton wool. This product is also super friendly on your pup’s eyes and does not contain any harsh ingredients like bleach, antibiotics, or other chemicals. Infused with juniper berries, this tear stain remover is a real treat and will leave your pup with sparkly angel eyes. Number 5 on our list is an awesome pick by Always Bright Eyes and this brand will truly put the sparkle back into your pup’s eyes. This little kit is a bit different to the rest and includes a specialized tear stain removing liquid, a special tear stain removing powder, and an application brush to ensure that you get the job done properly. This two-step system works hard to ensure that stains are removed, but also to prevent future ones. This herbal formula is safe on your precious pup’s eyes and doesn’t contain harmful chemicals, antibiotics, or synthetic fragrances. Thus, Always Bright Eyes put your pups eye health first and have formulated a product that works naturally to eradicate tear stains fast. Of course, when administering any product it’s always a great idea to consult your vet and chat to them about your specific needs, and your pup. Users have noted that this product is ‘just like magic’ and have commended it on its effectiveness when it comes to tackling dog tear stains. Excel’s 8-in-1 Tear Stain Remover Pads combine quality and value and will have your pup’s eyes sparkling in no time. These amazing tear stain remover pads are great for busy pet-parents who want a quick-fix to tackling those tear stains. Made from aloe vera and other gentle ingredients these wipes won’t irritate your dog’s eyes and will make them feel shiny and new in no time. These wipes are also great if your pooch is prone to saliva stains and can be used around their eyes and mouths (though of course not in their eyes, or their mouths!) To use simply wipe the affected area with the wipe and then rinse it with water. For heavily stained eyes, or mouths you will need to use the treatment more regularly. Lucky number 7 on our list is an excellent pick by Nutri-vet. 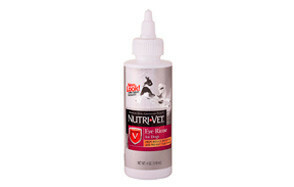 This specialized eye rinse for dogs helps to reduce irritation and can prevent the build-up of tear stains. Made by vets, this tear stain remover has been specifically formulated to meet your pup’s need and won’t irritate their sensitive eyes. This product is super gentle and is able to remove debris with comfort and ease. This is truly a wonderful pick if your pup needs some sparkle to their day and will transform a tearful pup, into a happy one. This product is suited to dogs. 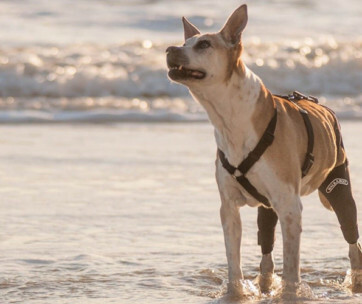 Number 8 on our list is a delightful product by Bodhi Dog. This gentle tear stain remover contains a number of natural ingredients like lemon grass oil and lavender oil and works gently to remove and lighten tear stains. This brand avoids harsh chemicals like bleach and promises an all-natural solution to your tear-stain problems. This brand pride themselves on being ‘tough on stains, but gentle on your pet’ and using this solution regularly will prevent a build-up of tear stains. This product is animal cruelty free in its production and comes in eco-friendly packaging that can be recycled. Thus, this is a great pick for all environmental advocates. What is more is that the makers truly believe in the top-quality of their product and offer a money-back guarantee if you are not happy with their product. Users have commended this product for its effective lightening of tears and ability to clean the eye area. Follow instructions for best results, and in if in doubt consult your vet. Last on our list of top tear stain removers for dogs is another wonderful product by Angels’ Eyes. When it comes to putting the sparkle back into your pooch’s eyes, you can’t go wrong with this amazing brand. This one is a little different to our other stain removing products in that you simply sprinkle over their food. Angels’ Eyes are known for using top-quality all-natural ingredients and this amazing pick is no different. This particular product is infused with Oregon grape root, marshmallow root, and cranberry powder and thus boasts an array of natural ingredients that will support your pup from the inside out. Since this yummy pick is also chicken flavoured it will please even the fussiest of pups and is a great pick if they have stains around their mouths. Users have commended this awesome tear-stain remover for its effectiveness, user ease, and tastiness. 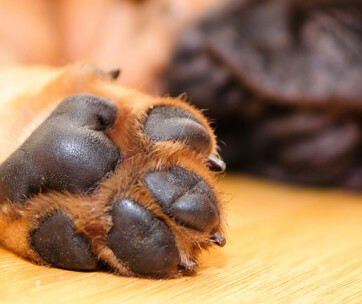 What Are Dog Tear Stains? Tear stains are red or brown stains under your pup’s eyes, or around their mouths. They are usually more visible on dog’s with lighter coats and certain breeds are more prone to getting them. Tear stains are usually an indication of excessive tear production and are usually not cause for too much concern. However, there are other medical issues that can cause excessive tearing and thus it’s always a good idea to get a medical opinion on the matter before you attempt to tackle the stains themselves. Always consult a vet if your dog is dealing with excessive tearing as it might be very uncomfortable for them and be a result of an underlying medical problem that needs addressing. Tear stains will be either reddish in color, or brown and rusty colored. Reddish tears are not cause for alarm and are a result of iron compounds leaving the body. However, if the tears are brown it might signal an infection. Reddish tear stains are caused by porphyrins which are natural molecules containing iron. They are simply a waste product produced by the body when red blood cells break down. Porphyrins are usually removed through excretion; however, they can also be removed through saliva, tears, or urine. However, if your pup’s tear stains are brown this is often a result of a yeast infection and your vet should be consulted as they might need to administer certain medications to tackle the infection. Yeast infections are usually caused because of the excess fluid from the tears remaining on the fur beneath their eyes. Feed your beloved pet a top-quality diet that is rich in nutrients and will boost their immunity and strength. 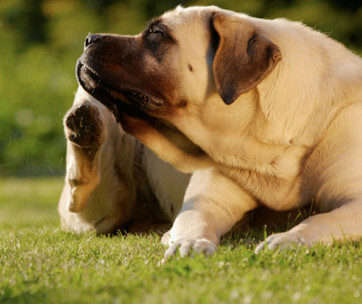 The stronger your pet is, the easier it will be for them to remove toxins from their bodies. Clean your dog’s eyes regularly and very gently with cotton wool, and water. If you notice they are experiencing eye irritation consult your vet who might administer a specialized wash, medication, or eyedrops. Replace plastic feeding and drinking bowls with stainless steel ones and be sure to wash them regularly to avoid a bacteria build-up that could lead to a yeast infection. Get your dog groomed regularly at a professional groomer and ensure that they don’t have excess hair around their eyes that could cause irritation. 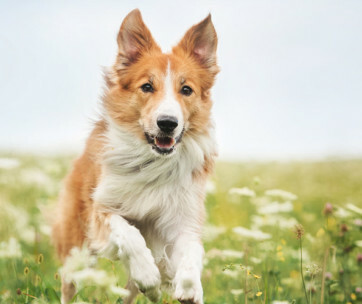 Consider a pet-friendly, vet-approved probiotic to enhance gut health and overall wellbeing. After all, they do say that gut health is the marker of overall health in humans and animals alike. 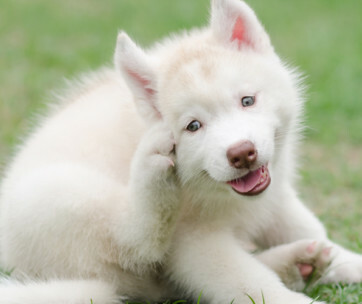 Clean your pup’s eyes regularly with a gentle, all-natural wash. If you notice eye irritation take them to the vet and make sure that their eye health is a top priority. Which Breeds Are More Prone to Tear Stains? While we truly believe in the effectiveness of all our top dog tear stain removers on our list and think they will all add some serious sparkle to your pup’s life, we’ve opted for the Tropiclean tear stain remover as our favorite pick. This facial cleanser is infused with oatmeal and blueberry and will gently and effectively remove even the toughest of tear stains. This gorgeous and refreshing blend with soothe irritated eyes and works gently to avoid further irritation or harm. This product is also soap free and utilizes a gentle coconut cleanser to ensure ultimate comfort. By avoiding harsh bleaches and detergents this brand will support your pup in feeling the best that they can and will turn those sad tear-stained eyes, into sparkling ones that are filled with happiness.